How do we promote an award-winning home to sell? To the buyer's ego. Pam, like may of our other clients, not only are open to our suggestions, but request we bring something new to the table for each of their ads or emails. 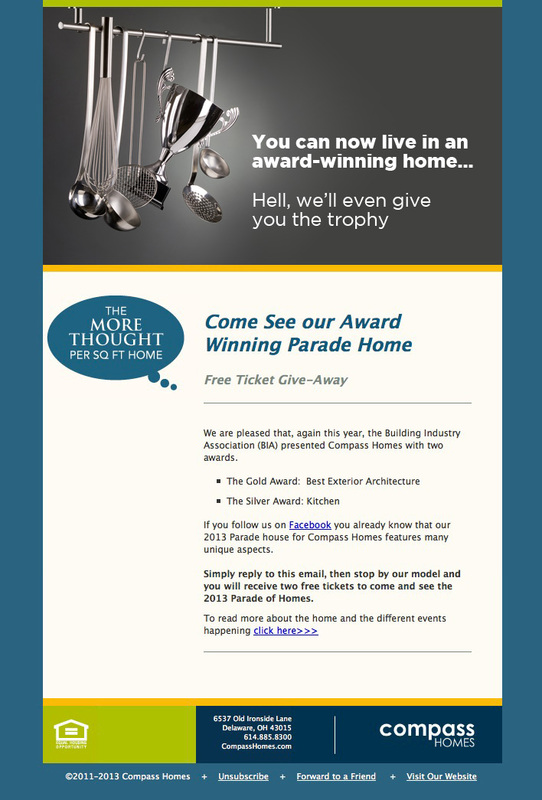 With this email, like the ad that accompanied it, we were asked to come up with an ad to sell their award-winning BIA Parade Home. One of them many awards they won that year was for their awesome kitchen. And since 90% of the buying decisions are made by women, and 99% of the buying decisions are made by women when it comes to buying a home) we focused on the award-winning kitchen, and showed an award hanging with the high-end cooking utensils. We told them they would have to be ready to give the new home owner version of the award for the kitchen should they ask, so they went got an award that kinda matched the one in the photo, had a plaque made for it with the homeowners names on it, and had it waiting in the kitchen when they moved in. Nice. We’ve also done the responsive website for Compass Homes, and all their ads. We like Compass Homes. There are two things that make or break your email blasts or enewsletter efforts: a bad email list and a bad enewsletter. Don't make the fatal mistake of emailing folks you don't know. You know how you go through your emails, right? You group the ones you don't know and delete them with ever opening them up. If you do that, the best case is you're wasting your time. The worst case, is you'll be blacklisted from emailing altogether by credible email services like Constant Contact or Campaign Monitor. Also, try not to make your enewsletter a sales tool: that gets old real fast. Make it engaging, educational and even entertaining, and your audience will look forward to receiving it. To go back to the home builder list of projects, click this link.